On this evening drive we saw two black rhinos, several dozen zebra and blue welderbeast, wart hogs and various types of antelope. 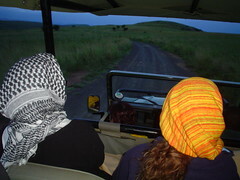 As it got darker I stood on the side of the jeep with a high powered lamp seeking out animals in the bush. Countless eyes, bright as stars looked back from hill tops and amidst the trees. We encountered a rare species of bird and a chamelion, both of which we were very lucky to find. Unless otherwise noted, this website is licensed under a Creative Commons Attribution 3.0 Australia License.